Motivations: For Love, Glory, or Money? Marketing expert David Rogers examines how digital technologies - - from smartphones to social networks - - connect us in frameworks that transform our relationships to business and each other. To thrive today, organizations need new strategies - - strategies designed for customer networks.
. . . and countless other cases from consumer, b2b, and nonprofit categories. 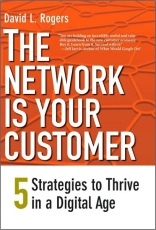 The book outlines a process for planning and implementing a customer network strategy to match your customers, your business, and your objectives - - whether you need to drive sales, to enhance innovation, to reduce costs, to gain customer insight, or to build breakthrough products and services. Because today, whatever your goals and whatever your business, the network is your customer.